Sathis Kumar, D., David, B., Harani, A. (2014). Evaluation of Antilipidperoxidation, Α-Amylase and Lipase Inhibitory Activity of Boswellia Ovalifoliolata Bal. Henry. Iranian Journal of Pharmaceutical Sciences, 10(1), 61-70. Dinakaran Sathis Kumar; Banji David; Avasarala Harani. "Evaluation of Antilipidperoxidation, Α-Amylase and Lipase Inhibitory Activity of Boswellia Ovalifoliolata Bal. Henry". 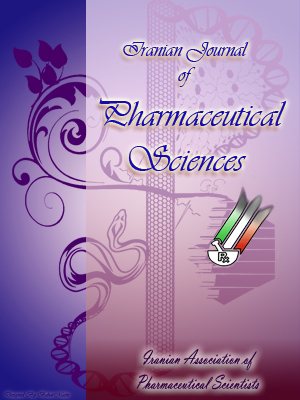 Iranian Journal of Pharmaceutical Sciences, 10, 1, 2014, 61-70. Sathis Kumar, D., David, B., Harani, A. (2014). 'Evaluation of Antilipidperoxidation, Α-Amylase and Lipase Inhibitory Activity of Boswellia Ovalifoliolata Bal. Henry', Iranian Journal of Pharmaceutical Sciences, 10(1), pp. 61-70. Sathis Kumar, D., David, B., Harani, A. Evaluation of Antilipidperoxidation, Α-Amylase and Lipase Inhibitory Activity of Boswellia Ovalifoliolata Bal. Henry. Iranian Journal of Pharmaceutical Sciences, 2014; 10(1): 61-70. 3University College of Pharmacy, Andhra University, Visakhapatnam, Andhra Pradesh, India. The objective of the present study was to determine the antilipidperoxidation and in vitro α-amylase and lipase inhibitory activity of the Boswellia ovalifoliolata Bal Henry (BOB) extract. The polyphenolic compounds, flavonoids, and tannins content of the extracts were estimated by spectrophotometry. Antioxidant activity on goat liver lipid peroxidation and linoleic acid was determined.Moreover, α-amylase and lipase inhibitory activities were evaluated. All the extracts showed antioxidant, α-amylase, and lipase inhibitory properties. Among the other extracts of BOB, macerated methanol extract could extract the highest concentration of polyphenols, flavonoids, and tannins. Even macerated methanol extract showed antioxidant activity on goat liver lipid peroxidation and linoleic acid were 62.83±4.723 (p<0.01) and 56.67± 1.43 (p<0.01) respectively. Maximum α-amylase and lipase inhibitory activities were expressed as 56.34±2.1 (p<0.01) and 79.36± 1.58% (p<0.01) respectively for macerated methanol and ethanol extracts. The results indicated that all the extract exhibited low inhibition activity as compared to standard.